Xtron Imaging offers a full range of Chiropractic DR systems from multiple vendors across Canada. We are also pleased to offer DR installation, x-ray system servicing, repair, Ministry room drawings, and HARP testing. 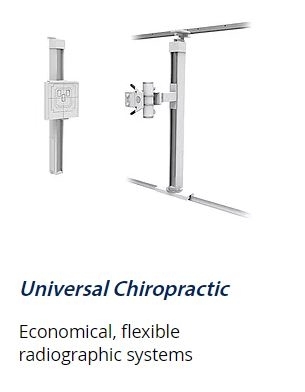 The Del Medical Universal DCChoice is an affordable, cost effective flat-panel digital x-ray system that will instantly improve the efficiency of your practice. Digital radiography provides a clean and streamlined imaging process by eliminating the need for cassettes, film, chemistry, automatic film processor, darkroom, film storage, and monthly maintenance. Vieworks VIVIX-S DR Systems offer a complete X-ray imaging solution by combining versatile detector options and the easy-to-use VXVue acquistion software. VIVIX-S detectors feature AED (Auto Exposure Detection), an internal Access Point, and internal storage capacity to ease installations and deliver the ultimate radiographic flexibility. VIVIX-S DR Systems utilize cassette-size detectors making upgrades for both human and veterinary applications quick and easy. Upgrade to DR in less than 2 minutes with just 2 components. Great image quality and reliability from a brand you can trust.